I shared this entry as a new post on the TechLearning blog, but am cross-posting here because of problems we’ve had with the commenting features over there. Feel free to comment on that post (if you can) or here. I had a conversation this evening with a professor from Oklahoma Christian University (OC) that broke my heart. This attitude, perhaps more than any other, may explain why we have so few laptop initiatives at both K-12 as well as higher education levels here in the great state of Oklahoma. Let’s deconstruct this professor’s statement a bit. What exactly was he saying with these two sentences? Here are some possibilities. I don’t know how to use digital technologies to engage my students in meaningful learning tasks, so I prefer to just lecture to them as I was lectured to for years in the 20th century. I believe the student’s only viable role in the classroom is that of passive receiver. I reject all conceptions and theories of active learning being good. I choose to be the only person in my classroom doing any real thinking and providing any real evidence of both hard work and cognitive exertion, therefore I choose to exclusively lecture. As the only person in my classroom with the initials “PhD” after my name, clearly I have the most knowledge and therefore should be the only person speaking once class begins. Students have nothing to offer me as a learner and nothing to offer each other during my classes that could be of value, relative to the infinite value of my ideas and perspectives about our topic of study. I am not interested in the literacies or the skills of the 21st century, my job role is to strictly impart the content from the textbook which I learned in the 20th century to my students. Digital technologies can only be used to distract and entertain, they can never be used to inform, challenge constructively and engage. My favorite metaphor for students in my class is that of a THRALL, or slave. When I speak, I not only expect but DEMAND that all students sit with rapt attention, hanging on with bated breath for my next ideological vocalization. Need I go on further? I asked this professor if he had heard of the website PollEverywhere, which permits students to immediately respond to multiple choice or open answer questions using their laptop or cell phone during class. He responded that he had not, but the IT department at UC was working on writing a program that would permit students to respond immediately like that during class. He had asked repeatedly for a set of classroom electronic response systems, but the university had not purchased a set for him. He also stated he was not at all interested in any type of open answer questions during class, he wanted only multiple choice questions and answers to determine if students understood the material he was presenting. I assured him that PollEverywhere offers this functionality NOW and could be used both with the laptops students have and the iPhones many of them will also likely have in class. I wrote down the website for him, and I hope he’ll check it out. When it comes to embracing the constructive uses of digital technologies to improve learning, I do not believe that anyone is a “lost cause.” At any time, a teacher or professor can “see the light” and come to understand that digital technologies CAN be used in constructive ways to extend and expand opportunities for learning. I’m afraid, however, based on this brief conversation with this OC professor, that he has a long way to go on the blended learning journey. How many professors and teachers at the VERY limited number of schools implementing 1:1 laptop learning initiatives today are like this one I talked with tonight? How many educators will insist, despite the fact that EVERY student in their classroom has a laptop computer ready at hand, to continue lecturing with overhead projector slides or a pedagogically equivalent PowerPoint slideshow, and completely miss the opportunities available to ENGAGE rather than merely ENTHRALL students? My heart goes out to OC students in this professor’s classes this fall. Hopefully his attitude is not representative more generally of faculty attitudes at OC towards student laptops and mobile computing devices. When you’re learning calculus, for instance, there are times when students simply have to sit and pay attention to an expert showing them how things work before these “21st century skills” are of any value. The fact that a calculus professor is an expert in calculus, and that the students aren’t, is real and it doesn’t imply arrogance or a desire to enthrall/enslave students on the prof’s part. When you have laptops or iPhones, a lot of possibilities open up for learning (even calculus) but there are a lot of difficulties introduced as well, and the temptation to inattention when attention is called for is one of the big ones. And perhaps that’s where this prof was coming from, which means that you need not feel sorry for his students. Give the prof the benefit of the doubt, and perhaps give a little more context of his remarks here in your post, rather than assume that the only possible attitudes he could have are a combination of arrogance and Luddite-ism. This is not unique to Oklahoma. My daughter is an education major at an university noted for its technology efforts and first class wireless networking everywhere on campus and beyond into the surrounding city. There are very few professors that understand the power of technology in the classroom. Its partially due to the inability of universities to require tenured professors or adjunct faculty to attend the type of staff development required in order to really kindle a passion for change. It has only been recently that some of these institutions have begun to hire people that assist staff in making technology connections. Yes, they have had help desks for technical questions, but now they are getting people that help make the connections. The students themselves are part of the problem. It’s hard for a professor to take technology seriously when the whole second row is playing solitaire and not doing the really constructive, cool things that we know they could be. Many students are experiencing the first taste of the freedom of having technology available 24/7, since many of our high schools have resisted allowing students to bring their own technology into the buildings. I do believe that university staff should be leading the way by utilizing technology in a way that shows students appropriate usage of the tools. A calculus professor should spend a bit of every class utilizing technology himself and showing students how to find resources that are relevant to the course content. When I went back to graduate school I spent a bit of every class day giving my professors ideas about improving their teaching by including technology. (Yes, they did pass me despite my critiques.) Some of them did take the information to heart and began to implement small changes. Since many of my classmates were also in education we began to challenge each other to incorporate technology into our presentations and group work. My kids have had technology available to them since they were two. As a family we are really tired of pushing the envelope only to have a fifth grade teacher say there is no reason for your daughter to have a personal organizer in my class. My child had pulled out her handheld computer, during a spare period, to put her spelling list into a game that she used to practice every week. I used to make my oldest child create a digital presentation in addition to the required, printed report. She hated the extra work, because digital presentations were never an approved option, but she influenced a lot of adults as a ten year old. When she went to college she knew how to impress a professor with just a little technology effort. In the end, my kids are prepared to work in a high-paced business environment. Their skills didn’t come from the current education system, but a parental effort. They can locate information as they need it. They are able to analyze that data and evaluate it’s worth. They know how to organize and present information requested. Their communication skills are way beyond most adults that I know. Technology is second nature. They don’t have to think about it. They do it with little effort and get on with the finer things in life. Robert: The reason this conversation hit me so hard was because this professor is completely closed off to the positive potentials of one to one technologies in his classroom and courses. I totally agree there are times when students need to be “lids down.” That was not his statement and perspective, however, it was that students ALWAYS need to be “lids down” because he sees laptops as well as mobile technologies as ONLY competing negatively for the attention of his students. We live in an attention economy, and I think the “battle for attention” in many classrooms is THE biggest obstacle to advancing an agenda of blended learning. This is the “enthrall versus engage” debate. Where at the high school level I see the most important question in terms of real educational reform being, “Are you willing to change the bell schedule?” I think the most important question in this context for colleges involved in 1:1 initiatives might be, “What choices are you providing your students in terms of learning tasks when they are ‘lids up’ in and outside of your classroom?” This latter question is applicable for K-12 contexts too, but it seems to be the critical question here. I actually think this professor IS a good teacher and instructor, based on what I have heard others say about the experiences their own students had in his classes. I think it is a tragedy at this point, however, that he does not appear to at all be open to blended learning possibilities. As I said in the post, however, all hope is not lost and his perspective can change at any time. Perhaps he will explore Poll Everywhere as one example of a tool that can be readily used in a fairly accommodating way to support his instructionist teaching style. That would be a small step forward. The journey is long, however. I will try and follow up on this. This IS an issue in many schools and colleges, not just those implementing 1:1 and iPhone/iPod Touch initiatives. I want to highlight the great video “Connected” from Abilene Christian University and their website on both mobile learning and convergence. As a vision for 1:1 and mobile technologies at the university level, their video and website is exemplary. The bottom line, however, is not what theoretical ideas are reflected on a website, it is what the instructors/professors and students actually DO with their technology tools to learn that matters most. I have high hopes for both Oklahoma Christian University as well as ACU. The administrators at both institutions have the vision and leadership gumption to support initiatives which clearly do not have universal support. Given the tools as well as robust just-in-time instructional support, however, a wonderful garden of digital learning can thrive. I’ll continue to peer over the wall and watch these seeds take root. I have to somewhat agree with Robert in that you generalized a lot from one comment — and though you might be accurate 100% —- MY HOPE IS THAT YOUR CONVERSATION WITH HIM IS NOT OVER YET. It seems like he is doing his job, administration is happy enough that he still works there, and he is seeing product and content being given back to him that reinforces his belief students ARE listening to him…..(not necessarily learning, but listening). So, why should he change?? That is where you step in. I know your life is hectic, that adding one more thing might seem unfathomable…..but I would suggest that you add his name to your calendar and do a monthly casual phone call. Invite him to join you at a conference when you go. Ask which blogs he reads and suggest a few of your own. I look forward to hearing more!! We’re about to adopt a 1:1 grant for 4th grade students in my district and my greatest fear is the teacher who allows the UMDs to sit in the charging cabinet when students could be using them. Yes, there are times when the teacher has to provide direct instruction, but we have to allow our students become responsible for their learning. How do you move that reluctant/resisitant instructor into a 21st Century model of teaching? Someone said to my yesterday that if medical advances moved as slowly as change in education, most of us would be dead now. Interesting comparison. I am not surprised by the reaction of the professor. So many educators feel threatened and intimidated by technology that they refuse to incorporate it into their classes. I teach at the secondary level and one of the concerns I hear from teachers is that it takes too much time to learn how to use the tools. Then there is the problem with how much time will be “wasted” trying to teach the students how to use them. 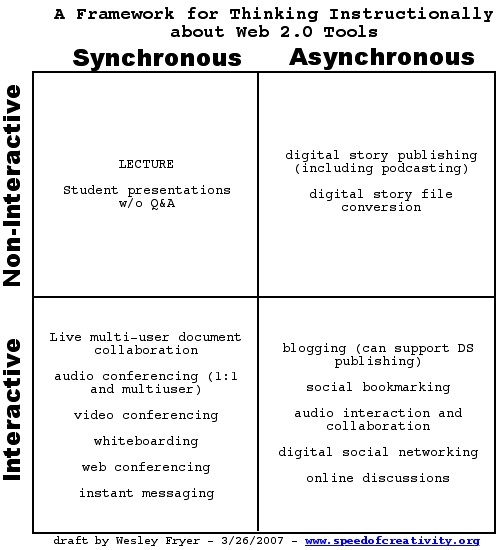 Those of us who support the implementation of Web 2.0 think of this as an investment, not a waste of time. I teach at an alternative high school and the vast majority of my students are at-risk. While they enjoy computers, they are not tech savvy. I tried very hard last year to deliver a course in a hybrid format. My students panicked at the thought of such a different format and I was still not confident in my ability to make it work. I back off of my plan and delivered the content in a way that they were more comfortable with. We have to accept that there will be growing pains as we make changes in our classrooms. One of the most important things we can get is support from our administrators and colleagues as we make the transition. In exchange we have to be willing to open the doors to our classroom to allow other teachers, parents, and school board members to see how we are using technology successfully.